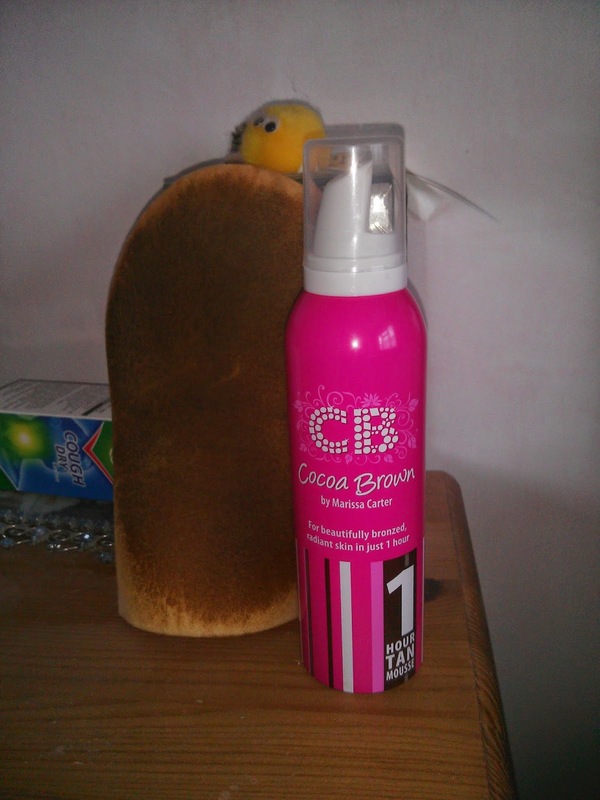 So when I was on holiday I just couldn't resist the offer of the Cocoa Brown tan from Marissa Carter for only £7.00, it was a complete bargain price for such an amazing product that will now be added to my beauty regime. Now let me tell you, I am pale (NW15, Ivory ect ect)! so when ive looked at tan in the past ive been super scared that it'll just end up horribly wrong and that ill end up orange. However, from the photos below you can see that in fact I am NOT orange but have a light/medium brown tan. The appearance of the bottle seems pretty minimalistic, but easily recognisable in the bright pink bottle. The product comes out in a mousse, which when put on the mitt looks quite pale however the product continues to darken on your skin for three hours. In case you didn't know on the bottle it recommends that once you apply it all over you then leave it for one hour (I left it for two) and then you get into the shower and lightly rinse it off. 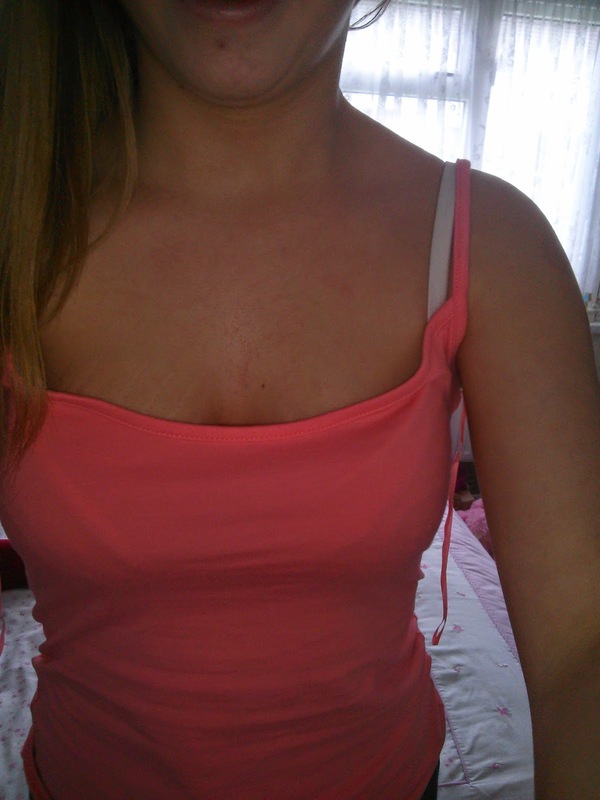 You can then fully see how the product has fake tanned your skin. As you can imagine, your skin needs to be in the proper condition before you apply fake tan to insure it looks its best. - A Tanning Mitt to help you apply the mousse to your skin evenly and to prevent the awful looking orange palms. -A Body scrub (mines soap and glory)to buff away all the dry skin especially around your elbows and ankles as dry skin seems to pick up more fake tan than regular skin casing an uneven application. 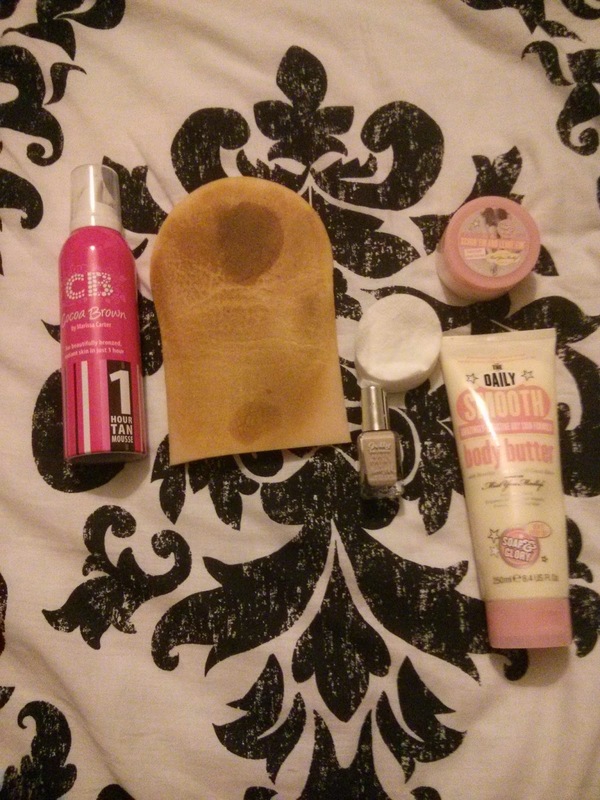 - A body moisturiser/butter (mines the daily smooth- Soap and Glory) to smooth out your skin. Make sure that it has fully sunk in before applying the tan. - A nail varnish (mines Barry M Gelly in Lychee) to apply to your nails on your hands and feet to prevent the tan from going on your nail bed. - Some cotton wool to apply the fake tan to your face, hands and feet as these places require less tan. - Finally something I forgot to add into the photograph (slaps hand) is Vaseline to apply to your eyebrows and hairline to prevent discolouration. So the application is extremely easy, you add the mousse onto the tanning mitt and apply it in a circular motion until the right amount is even all over your body. I also got my mum to add the tan onto my back because I cannot reach to do it myself. The bottle says "1 hour tan", but I left mine on for two hours (the maximum is three) before rinsing it off in the shower without using shower gel or body scrub. You can then get on with your day without worrying about the tan! voilà! ps. sorry for my cats tail in the right photo, she likes to get in on the action.